"It's not that important to me to burn off a Snickers," Maralee Bradley said. camera (Courtesy Marilee Bradley) Marilee Bradley, a mom of six from Lincoln, Nebraska, eliminates the guilt of eating too much Halloween candy with a funny "candy chart" she posted to her blog. 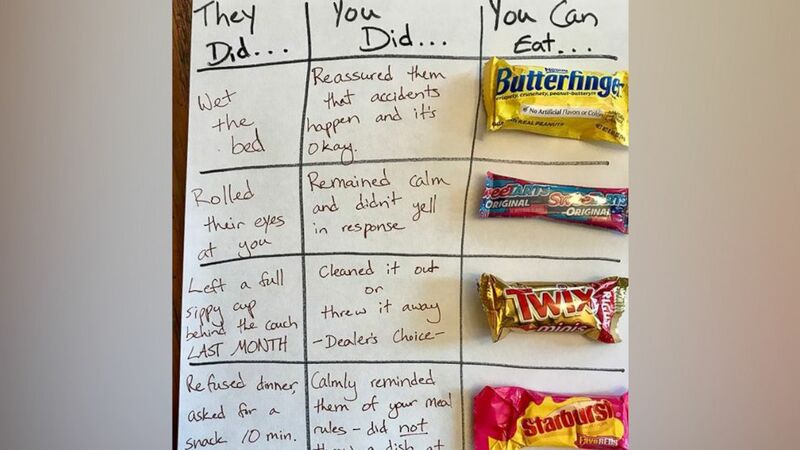 A mom created a genius candy chart to eliminate the guilt parents feel after sneaking too much of their kids' Halloween candy, and it has us laughing all the way to the trick-or-treat bags. Maralee Bradley, of Lincoln, Nebraska, told "Good Morning America" that she designed her parody chart after seeing another chart on Facebook that counted the calories of fun-size candies and what exercise would be needed to burn them off. "Motherhood is hard enough without candy guilt," Bradley wrote on the Facebook page for her blog, A Musing Maralee. "So I whipped up this little chart to put a bit of a different spin on it. Motherhood is hard, candy is delicious and maybe it's okay to sometimes give ourselves a little reward for being awesome moms." 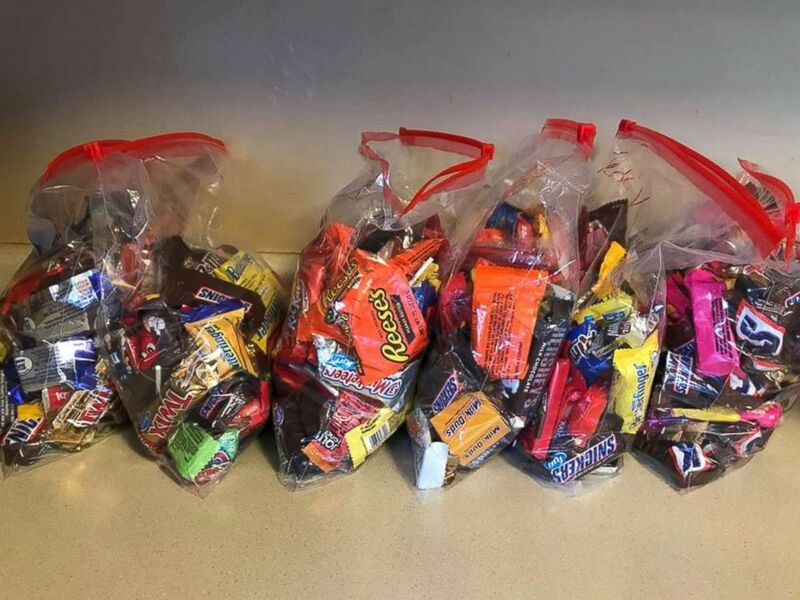 Thanks to her six children, Josh, 12, Danny, 9, Bethany, 8, Joel, 6, Carolina, 5 and Teddy, 4, Bradley said trick-or-treating yields giant bags of candy, which are currently gracing her kitchen countertop. She told "GMA" she decided to post her chart to encourage other parents to reward themselves with a piece of candy for making it through tough times, such as an unexpected, 2:37 a.m. wake-up call from a little one. 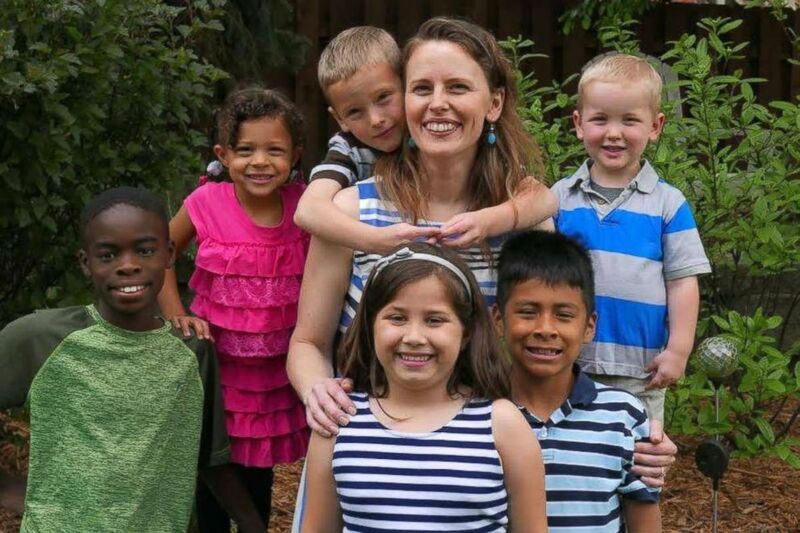 (Courtesy Marilee Bradley) Marilee Bradley of Lincoln, Nebraska, poses in an undated photo with her children, Josh, 12, Danny, 9, Bethany, 8, Joel, 6, Carolina, 5 and Teddy, 4. "It's not that important to me to burn off a Snickers," Bradley explained. "It's actually important to me to feel like I'm being a good mom and rewarding myself and not feeling guilty for that." She began doodling, and the results were hilarious. Jillian Schnerch, 13, created the look with the help of her mom. "It kind of breaks that isolation that you're the only one who's dealing with the pressures to be the perfect mom, and have the perfect diet," she added. (Courtesy Marilee Bradley) Marilee Bradley of Lincoln, Nebraska, has six children who collected a great deal of candy this Halloween. Since she posted it Monday, Bradley's chart has garnered hundreds of likes from parents who say they can relate. "It feels so sweet to me to feel like we are all in this together," she said.